Discussion in 'Colored Gemstones' started by elle_71125, Jun 24, 2017. I'm taking Acinom's advice and starting my own gem thread. I will be sharing all my new gems and projects right here. Lovinggems, Aino, JmeeMrie and 12 others like this. I don't have much of anything new to add. Most of it was recently posted in the "catch all thread." I am hoping to be working on a pink spinel ring soon. Big Blue may have put a hold on that for a while, until I can build the piggy bank back up. A few people asked for a pic with the pink spinel and the pink melee. So, that's below. What do you guys think? Does it match well enough? Hounddog, NKOTB, Lula and 9 others like this. Yay!! Sitting front row in your thread. Thank you for starting this. Your introduction pic reminds me of the homepage photo on the Precision Gem website: ypur stones are equally amazing and saturated. Love your bright spinel and the melee! It looks like a perfect match. Do I indeed detect darker and lighter melee mixed? Arkteia, MissyBeaucoup and theredspinel like this. Oh I LOVE the melee it's like little sprinkles of pink spinal goodness. I think the melee are a bit lighter then the centre stone? Do you like that? Oh ps you gota add those handshots here too! Can't get enough of that pics. I just looked up the precision gem website. Where can I find me some moss covered rocks? What a great background for pictures. Aw. Thank you. It's an honor that your my first comment. I love scrolling through your thread to admire your gorgeous pieces. That black opal, for instance, is too die for! There are some lighter melee mixed in. I've been thinking about buying some extra melee so I can color match a bit. We on PS are nothing if not perfectionists. I've been having a hard time nailing down the exact design I want so I've been holding off on the extra melee. I could take pics of each stone but I wouldn't want to overwhelm everyone. That would be naughty. FeFeV and Acinom like this. Asscherhalo_lover, Laila619, LJsapphire and 18 others like this. They are a bit lighter. I figure if I don't want to use them in the ring, I will put them in a coordinating band. Here was a really, really sad mock up of my ideas for a band. From your mock ups, love the bottom one! Where can I find me some moss covered rocks? FeFeV, Keeliamira, MissyBeaucoup and 2 others like this. Think of the things we could accomplish if we combined our forces. You should take a pic of your new dementoid ring out there. I bet it would look awesome! Yay!! So happy to see you start this thread, Elle ! You gave a great eye for color: what a collection. Curious though, maybe I missed it before or just plain forgot, but what is the purple cushion in your hand shot? Ammy or garnet? Details please!! FeFeV and elle_71125 like this. Elle you have an amazing collection and I agree with Mochi that you have an eye for color. I love all your gemstones both loose and in those amazing settings. Your Paraibas are so stunning. I think I could actually love them more than spinels. FeFeV, elle_71125 and MissyBeaucoup like this. I love the photos of all your loose gems together! tye rainbow of colours and how vivid they are make me think of a whole lot of stunning (gem) candies for some reason haha... it's enough to make ME drool at least! You picked the perfect nail color to bring out that rainbow of gems! They are all gorgeous and I am especially loving the purples today. Good luck with your setting projects! The halos you've done are amazing. +1 and ditto what they ALL said! Such a happy delightful panorama of colors, can't wait to read and live vicariously through your setting and collecting journeys ahead! What an amazing photo and collection! They are all eye poppingly gorgeous! Lovely gems Elle! Very colorful! Yay for starting your own thread. I love the family pictures, Elle. Really. Talk about a family! All the color makes me swoon. Can't wait to see what you do with your beauties. Now that I've had some time to think about your melee, I do kind of lean toward using them in their own band. That idea seems to resonate (more) with me, but I'm sure they'll look great wherever they end up. P.S. I'm noticing the nail color. hehe They look awesome! I'm so glad you started your own collection thread Elle. So far, so gorgeous! 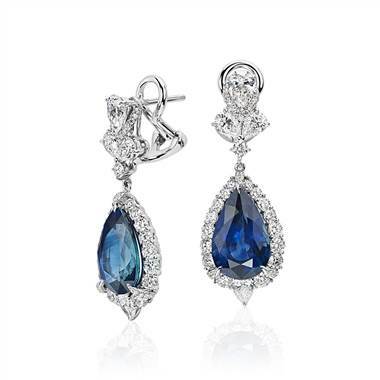 What is your big, blue lovely stone? Mochiko, thank you. I'm a huge fan of your collection too. The purple cushion is a garnet. It's 3.79ct. I bought it off of a Facebook group a while back. LisaRN, how sweet are you! I think the paraibas are my absolute favorites but bright pink spinels (your mahenge included) are definitely right at the top of my list. Crystal_Dreams, if only they tasted as good as they looked. On second thought...that would be some expensive candy. MissyBeaucoup, thank you. I really need to stop buying things so I can focus on setting some of these. Halos are my favorite, in case it's not already obvious..lol. Minousbijoux, that means quite a bit coming from you. I absolutely love seeing your gems! Arkteia, me too! I keep going back and forth on ideas. SparkliesLuver, thank you again for Big Blue (and for noticing my nails ). I should ask you, since you owned it first. Do you think of Big Blue as a boy or a girl? I keep wanting to refer to it with a gender but I just don't know. With the spinel, I've been leaning towards a band too. I've always wanted one so this would be perfect in my mind...now let's see if I can afford it. I'm glad you asked. I did post about it on the "catch all thread". Link below. It's a huge 3.93ct blue green tourmaline cut by Jeff White. I picked it up from SparkliesLuver (who, because of this, is currently my favorite person ). apacherose, Hounddog, NKOTB and 4 others like this. So now we know the quickest way to your heart! apacherose and elle_71125 like this. That is just too gorgeous! It's huge! Well done! Did anyone see CvB post this beauty last weekend? I'm lucky enough to be her new owner. Here's the video CvB posted on her instagram. apacherose, Hounddog, valeria101 and 3 others like this. Elle- I am so happy this gem went to you! Gorgeous color and rare size in Mahenge. Do you have any plans for this beauty?